Professor Yum was born in Shanghai. He received primary and secondary school education in Hong Kong. He went to Columbia University and was awarded BS, MS, MPh and PhD degrees in 1974, 1975, 1977 and 1978 respectively. He joined Bell Telephone Laboratories in April 1978 working on switching and signaling systems for 2.5 years. Then, he taught at National Chiao Tung University, Taiwan for 2 years before joining The Chinese University of Hong Kong in 1982. He was appointed chairman of IE Department two times and elected Dean of Engineering for two terms (2004-2010). Since June 1, 2010 he took no-pay leave from CUHK to serve as CTO of ASTRI www.astri.org (Hong Kong Applied Science and Technology Research Institute Company Limited). Professor Yum has published widely in Internet research with contributions to routing, buffer management, deadlock handling, message resequencing and multi-access protocols. He then branched out to work on cellular network, lightwave networks, video distribution networks and 3G networks. His recently research is in the areas of RFID, sensor networks and wireless positioning technologies. He and student Lei Zhu was awarded the Best Paper Award of ACM MSWiM 2009 with paper title, "The Optimization of Framed Aloha based RFID Algorithms." He and another student Xu Chen were awarded the Honorable Mention Award (the first runner-up of the best paper award) with paper title "Cross Entropy Approach For Patrol Route Planning In Dynamic Environments" in IEEE international conference on Intelligence and Security Informatics (ISI), 2010. Professor Yum is on the editorial board of 6 international journals on Communications and Information Science, including the IEEE Transactions on Communications. He was also formerly an editor on IEEE Transactions on Multimedia. Recently, he joined the editorial boards of Acta Electronica Sinica, Chinese Journal of Electronics and China Communications. Since 2008 he also serves on the Awards Committee of IEEE Communications Society. Professor Yum's diverse industrial experience includes Bell Labs, Bellcore (now Telcordia), IBM Research, Motorola Semiconductors and ITRI of Taiwan, SmarTone Communications and Radio-Television (Hong Kong) Ltd. Since 2008 he is appointed concurrently as chair professor at the Institute for Theoretical Computer Science of Tsinghua University. In spring 2006 he was appointed the Fulbright Hong Kong Distinguished Scholar for lecturing in US universities. In spring 2008 he was appointed Distinguished Visiting Fellow of the Royal Academy of Engineering (UK) for lecturing in UK universities. 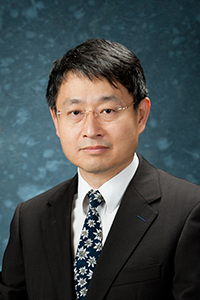 Professor Yum is the founding director of the Information Engineering program and later served as the chairman of the Information Engineering Department. Together with Professor Michael Chang, he founded the Hong Kong SchoolNet in 1993 to provide Internet service to selected secondary schools in Hong Kong. Hong Kong SchoolNet was evolved to Hong Kong Education City www.hkedcity.net serving all primary and secondary schools in Hong Kong under the able leadership of Professor P.C. Wong and funding from the Hong Kong SAR Government. Professor Yum likes reading. He plays tennis and badminton regularly. He is the sponsor of the annual youth bridge camp organized by Bridge House. He is also the Honorary Captain of the Chinese University Badminton Team. He is affiliate with the Shaw College and has been Fellow and Trustee member of the college for many years.